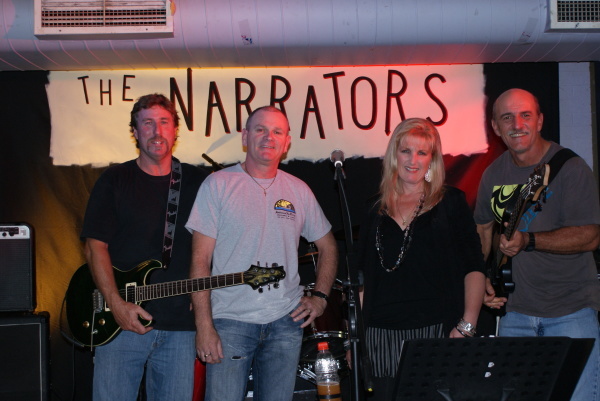 The Narrators are a four piece covers band bringing together a very solid and tight unit of fine and talented local musicians. With many years of experience between them, this outfit delivers each and every time they play. Coming from such bands as Witlaw, Fat Chance, Doctor Pepper and Vicious Circle, The Narrators have punch and a great sound. With Sharon's diverse voice she is able to sing quite an array of genres with passion and gusto. Trevor on bass, plays with a no frills approach and has his own distinct style. Mark on drums compliments Trevor with a creative drumming technique and his strong vocal range makes the most challenging rock song possible. Craig on guitar is a fine talent and he attacks any song with the confidence and flair that the other members admire. The Narrators are a fine band with members that really enjoy what they do. Catch them at a venue near you.